Taking aspirin is associated with a lower risk of death from prostate cancer, especially in men with high risk disease, according to a multicenter study published in today’s issue of the Journal of Clinical Oncology. 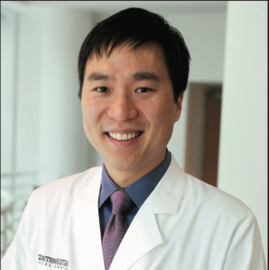 Dr. Kevin Choe, assistant professor of radiation oncology at UT Southwestern, is first author of the paper. Preclinical studies have shown that aspirin and other anticoagulation medications may inhibit cancer growth and metastasis, but clinical data have been limited previously. The study looked at almost 6,000 men in the Cancer of the Prostate Strategic Urologic Research Endeavor (CaPSURE) database who had prostate cancer treated with surgery or radiotherapy. About 2,200 of the men involved – 37 percent – were receiving anticoagulants (warfarin, clopidogrel, enoxaparin, and/or aspirin). The risk of death from prostate cancer was compared between those taking anticoagulants and those who were not. The findings demonstrated that 10-year mortality from prostate cancer was significantly lower in the group taking anticoagulants, compared to the non-anticoagulant group – 3 percent versus 8 percent, respectively. The risks of cancer recurrence and bone metastasis also were significantly lower. Further analysis suggested that this benefit was primarily derived from taking aspirin, as opposed to other types of anticoagulants. The suggestion that aspirin, a frequently prescribed and relatively well-tolerated medication, may improve outcomes in prostate cancer is of particular interest, Dr. Choe said, since prostate cancer is the most common non-skin cancer among men and the second-leading cancer killer in the U.S.
Dr. Kevin Choe discusses recent findings which suggest that men who have been treated for prostate cancer, either with surgery or radiation, could benefit from taking aspirin regularly. Other scientists involved with the study include Janet Cowan, Drs. June Chan, and Peter Carroll of the University of California, San Francisco; Dr. Anthony D’Amico of Harvard University; and senior author Dr. Stanley Liauw of the University of Chicago. To learn more about clinical services in radiation oncology at UT Southwestern, including highly individualized treatments for cancer at the region’s only National Cancer Institute-designated center, visit http://www.utsouthwestern.edu/radiationoncology or http://www.utsouthwestern.edu/cancercenter.